Okay, it’s not new news. 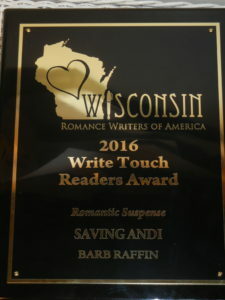 I posted about SAVING ANDI winning the Write Touch Readers’ Award when I was notified. I even posted a pic of my local Wisconsin Romance Writers of America group giving me a dozen red roses. But the celebration continued at the WisRWA conference May 19-20. Check out the beautiful plaque I got! This entry was posted in Amnesia Victim., Collections & Anthologies, Fiction Readers, PROMO, READERS, Romance Readers, romantic suspense, Uncategorized, Woman in Jeopardy and tagged Abandonment issues, animals in love stories, books set in Michigan, contemporary romance, Family relationships, midwest setting, romance novel set in Michigan, rural setting, St. John Sibling Series on May 30, 2017 by Barbara Raffin. WHERE DID I GET THE IDEA TO WRITE SAVING ANDI? 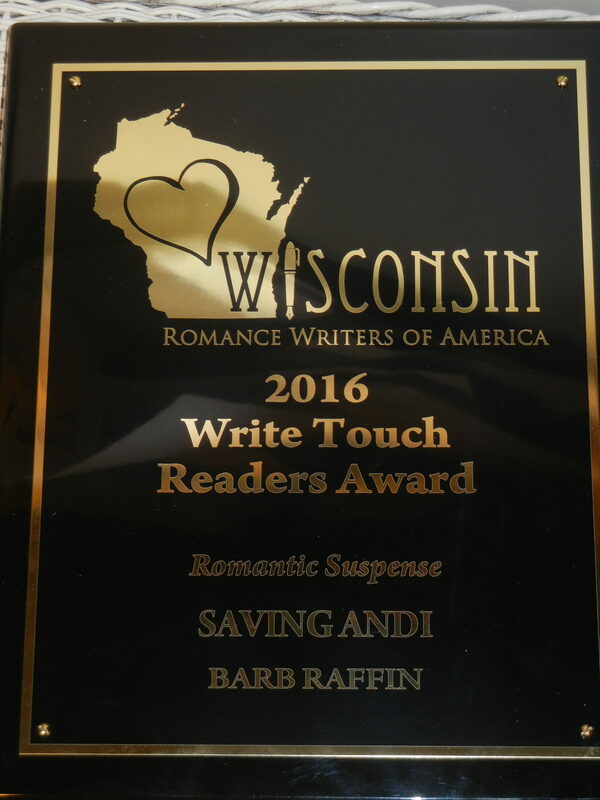 Since winning the Write Touch Readers Award with SAVING ANDI, I’ve been thinking maybe you’d like to know what prompted me to write this romantic suspense. It started with Andi Johanson making an appearance in CRAVING A HERO. She’s the character who plows out Kelly’s family camp when Kelly and Dane get snowed in (don’t get me started on the bombshell that forced togetherness exposed) and later for their Valentine Day winter wedding. Initially, Andi was a guy with a different that was going to make a walk on and never be heard from again. But this young woman living hand to mouth reached out from the back of my brain and I knew SHE was supposed to be driving that beat up old truck with the plow. When Andi let me see into her past–see what a hard childhood she’d had, I knew she had a story that needed to be told. In my last blog post about SAVING ANDI, I mentioned Andi’s rough childhood. Cruel is a more appropriate adjective what with an alcoholic father who viewed women as little more than chattel to do his bidding and an older brother following in his path. Her mother’s premature death left Andi to take on the household duties and to mother her younger brother. Put them all in an isolated cabin on a wooded lake living hand to mouth because Dad couldn’t hold down a job and you have a recipe for everything from poaching to outright burglary. 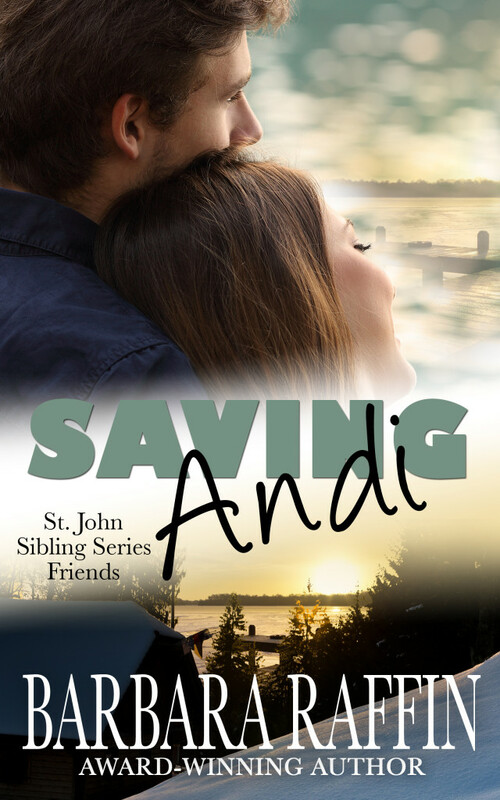 This is the environment that shaped Andi, the only saving grace her need to protect her younger brother—to see him free of the harshness of their lives. Her mother had instilled at least that much integrity in her before she died. But a drug addicted older brother, a protective young brother, and the law all came together to one fateful afternoon, shattering the one hope she had in life; that her baby brother could escape their wretched life. It left her with the burden of guilt and a big distaste for cops. A year and a half with her baby brother dead and big brother in prison, Andi has given up on life–hope…until she finds Cole McCall, a man with a bullet hole in him and no memory. Prime for a dangerous liaison, she takes him in, nurses him back to health, and hides him from the authorities. Too bad whoever wants Cole dead are still tracking him. This entry was posted in Amnesia Victim., Fiction Readers, PROMO, READERS, Romance Readers, romantic suspense, Uncategorized, Writers and tagged Amnesia victim, animals in love stories, books set in Michigan, contemporary romance, love story, midwest setting, romance novel set in Michigan, romantic Suspense, rural setting, St. John Sibling Series, woman in jeaopardy on March 24, 2017 by Barbara Raffin. VISIT ME ON THE 8TH!